The West is overrun! Ever since the dead rose at Gettysburg, Vicious beasts intent on terrorizing people into the grave (and right back out again) have plagued mankind. In the wilderness and in the cities, monsters lurk. Unless someone roots them out, humanity will surely perish. 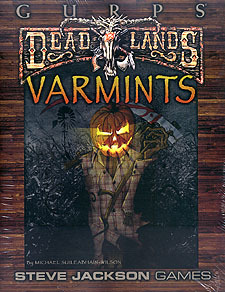 GURPS Deadlands: Varmints provides everything you need to take your GURPS Deadlands campaign into the lair of the beast. Abominations - the Reckoners' direct servants - like the terrifying Plague Rider. Dozens of varieties of unquiet dead - mummies, zombies, ghosts, and many more. Strange animals for every climate and terrain. Entirely new creatures, such as the Hive Buffalo and the Phrenomesmeric Zombie. Advice on creating and playing some of the West's weirdest creatures - as PCs!